As Industry 4.0 morphs from concepts and ideas into working, real world applications, factory and production equipment is utilising industrial networks to become more connected and intelligent. This is largely driven by the need for better performance, efficiency and productivity. The selection of a communication protocol, from both a hardware and software perspective, will also need to factor in considerations such as redundancy, flexibility, expansion and ease of implementation. Importantly, adding intelligence to machines also gives the opportunity to implement a predictive maintenance strategy. The ability to foresee issues and then plan rather than react to maintenance needs minimises downtime and its associated costs and is extremely valuable to operators. Smarter manufacturing plants with a predictive maintenance approach can only be achieved by collecting significant amounts of sensor data in real-time. Production line versatility, which is a key benefit of smart manufacturing for companies making a number of different products, needs data to support decisions and then adjust and re-balance lines. IO-Link, also known as SDCI (single-drop digital communication) is an open communications protocol that has emerged from the crowd of longer established alternatives as being a cost-effective yet powerful platform that is well aligned with Industry 4.0. It enables simple, scalable, point-to-point communications between sensors or actuators and the controller, in very simple terms it is like having an industrial USB. Parker Hannifin is one of more than 130 companies in the IO-Link community which can boast over 3.5 million nodes achieved in the field to date. This is a degree of market penetration that demonstrates not only relevance to market needs, but also reliability. Automated factory environments typically include large controller cabinets housing PLCs along with I/O cards and many I/O terminations. These provide the interface for all machine-to-machine communications. IO-Link’s low-cost IP67 master blocks allow much of this to be moved out onto the machine, significantly reducing cabinet space. This is achieved by establishing communication via an IO-Link master situated closer to the point of sensing and therefore simplifying the communications and cabling arrangement. This is at a significantly reduced cost versus using IP67 Ethernet blocks for on-machine I/O. Compared to discrete wiring, IO-Link significantly reduces the extent of wiring needed between manifolds and sensors as is the number of interconnections. This enhances overall reliability as every interconnection represents a potential point of failure or compromise in system reliability. In addition, the standard non-shielded M12 cables and connectors used in IO-Link have just three or five wires and offer many design, implementation and reliability benefits when compared to traditional 25-pin/D-sub connectors commonly used in machine and production automation and control systems. Current trends are towards predictive/preventative rather than reactive maintenance. Predictive maintenance is widely recognised as the ‘way to go’ in many sectors – not just industrial automation. A study by Accenture and GE found that predictive maintenance can generate a 30% reduction in maintenance costs and an up to 70% cut in production line downtime caused by equipment breakdowns. IO-Link is especially well-suited to such an approach and philosophy. While the main cost and downtime reduction benefits can be reaped during the long working life of a production process and system, there are also important pluses to IO-Link at the installation stage. Due to its simpler point-to-point topology, IO-Link is faster and easier to install than other monitoring and control approaches, including Ethernet. It allows for rapid troubleshooting at the commissioning stage that can be performed either locally or remotely. The detection and resolution of false sensor settings and other snagging issues are also much more straightforward to detect, isolate and resolve. Versus a centralised, proprietary arrangement, IO-Link’s decentralised model also delivers cost benefits, this is both in terms of the actual cost of the required hardware, and the labour cost to install and interconnect hardware. The major and ongoing benefits of employing IO-Link are to be enjoyed during the regular working life of the installation. With multiple, and easily extendable sensing points IO-Link gives extensive, precision data points on the machine and then communicates that data in real time allowing processes to be closely monitored. Sensor detected excursions (beyond adjustable pre-set parameters) trigger alarms and can be quickly addressed before costly, unplanned interruptions to production or compromised quality of the products being made by the process become a risk. 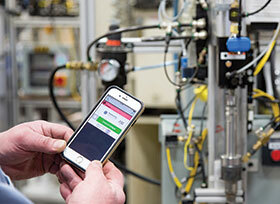 In many cases, early sensor notification of issues can allow system operators to investigate, consider, plan and schedule the required corrective maintenance for a time when production throughput is either low or can be stopped. This could be overnight, or during a larger planned plant maintenance shutdown. Cost and disruption of unavoidable downtime are reduced and replacement components can be sourced and repairs carried out with utmost control and efficiency. Due its decentralised, plug-and-play topology, IO-Link is inherently flexible and this is enhanced by its vendor neutrality with modules and devices from different suppliers able to be easily combined. This can allow the extension or modification of existing implementations by adding more sensors and actuators to give enhanced diagnostics, monitoring and control. This means that reconfiguration of production environments is quick, easy and low risk versus other more complicated and vendor-tied industrial Ethernet approaches. Not all production environments are clean, dry and free from vibration and other environmental challenges. These can threaten the reliability of communications infrastructures installed to sense, monitor and control processes. This is especially true where there are a large number of interconnects with each representing a potential point of failure. The standard, non-shielded, five-pin proximity switch cables and connectors used in IO-Link, are designed specifically for industrial applications and are robust with either IP65 or IP67 ratings underlining their resilience to the challenges of most operating environments. As all IO-Link data transfer is based on a 24-volt signal, susceptibility to electrical interference is not an issue and screened cables and grounding seen in other approaches is not necessary. With widespread implementation of smart factories a positive inevitability, it is important to have a dedicated communications infrastructure that maximises the easing of implementation and then the versatility to adjust to changing needs and configurations. In addition, with the benefits of predictive maintenance well understood, many manufacturing organisations are keen to adopt the strategy and begin enjoying the business and continuity benefits. IO-Link is well positioned and equipped to deliver on these needs, and backed by its inherent robustness and vendor neutrality, become the industrial communications approach of choice for many sectors. Turck demonstrates the flexibility of its BL20 multiprotocol gateway in conjunction with the IO-Link-capable TBIL hubs.